"We are on a very long journey of the soul, however we can’t move forward on this endless path without an open and free mind." Change, expansion and evolution is the reality of the physical universe. Our own planet has undergone near five billion years of evolution. However, we don’t just evolve physically or as species, we also evolve mentally and conscientiously. Through reincarnation and maintaining an open mind our souls can also evolve and grow with no limit. We are on a very long journey of the soul, however we can’t move forward on this endless path without an open and free mind. As soon as we close our minds, because of religious dogma, fundamentalism, orthodoxy, misguided sense of spiritual elitism, or an enslaved sense of self (a mind that is enslaved to a guru, a sect, a god or deity) we stop evolving. 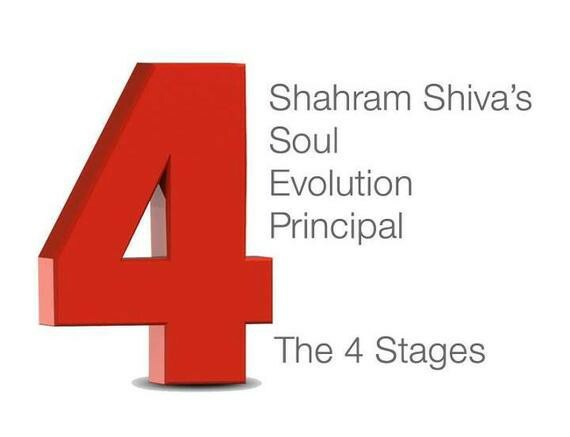 I have categorized my humanity’s Soul Evolution Principal in 4 stages. Of course, a lower level mind doesn’t know about the other steps. For example, while you are in Level 2 (religion), even if you read about the Level 4, chances are you would simply ignore it or consider it “crazy.” However, a higher-level mind certainly is aware of the other 3 steps as it has been there before. I have seen on my Facebook page rather violent reaction from people in Levels 2 or 3 when they read about my Soul Evolution Principal, because it challenges their belief system. Level 1 — The Animal or Primitive Mind. Those at Level 1 are only concerned with survival, physicality and reproduction. They aren’t capable of higher thinking, which is a carryover from their mostly new incarnation from the animal world. Almost all animals’ focus is work (food, survival, shelter) and reproduction. Hence the mind at this level stays the course. Level 2 — Enters Religion. Filled with dogma and fear of punishment, it introduces basically what is soul slavery. Religions of the world program the followers to worship invisible beings and deities and surrender notion of self. Some religions openly refer to their followers as “sheep.” However, religion also brings about a vague concept of higher thinking and it introduces the principal of a divine soul. Even though it also invents the incredibly dark term “eternal damnation.” Due to very strong programming and the closed minds of the followers, most souls will not be able to ascent beyond this level. In fact Level 2 dwellers are routinely quite fanatical about clinging to their religion. Level 3 — Spirituality 101. As a progressive soul evolves it sees through and naturally sheds the simplistic mind and soul control tactics used in religion. Many souls looking for answers outside of religion are drawn to Eastern-style spirituality or what is commonly called yoga or yogic teachings. Due to strong programming that also exists in basic spirituality the seeker wrongly considers spirituality to be the ultimate truth (a fanatical pattern carried over from Level 2) and falls into another mind trap. Spirituality 101 certainly is more evolved than religion, as it introduces more light into the teachings. However, as religion may contain only five percent truth, the Spirituality 101 increases that dose to about 25 percent. Spirituality 101 is only another step in our soul evolution and it shouldn’t be considered to be the final step. Spirituality 101 is also dogmatic and tries to control people through fear. Whether it’s fear of bad karma or fear of regression or fear of being disliked by the guru or by countless deities. Many spiritual sects maintain the concept of soul slavery and promote slave mentality and worship. The followers are trained to use deities and gurus names as mantras and repeat their names with every breath, at all times or chant their names out loud for days on end. They also demand total surrender and minimize the affect of the mind and logic to keep their followers small and dependent. The Spirituality 101 world is filled with agenda-driven men and women who prey on the innocent. This, in some ways, is even tougher to evolve out of than religion. Most people will be stuck at this level for a long time since it involves even deeper programming. Level 4 — The Beyond. Once you understand and truly inhabit your soul’s worth, your true origin, your infinite path and ultimate destination, you’ll gradually evolve beyond the basic spirituality as well. Your soul reaches adulthood and it then can become independent. All the past shenanigans and con artistry fade away. The thoughts of soul slavery go away. New revelations are revealed each day. You transform from a slaved-soul to an empowered-soul. You change from a dependent-spirit to a self-guided entity. The Beyond is where your soul journey starts actually. Up until now you have just been in training. You need strength of the soul, strong sense of self and acceptance of the notion of self-love. Only progressive souls with infinite thirst for the truth and clear, open minds can get to this point. Dogma and hypocrisy don’t have a place here. Rumi calls my Level 4 a place beyond right or wrong, good or bad and dark or light. It’s my intention and my mission to inspire, guide and help you to get to Level 4 and keep on expanding.